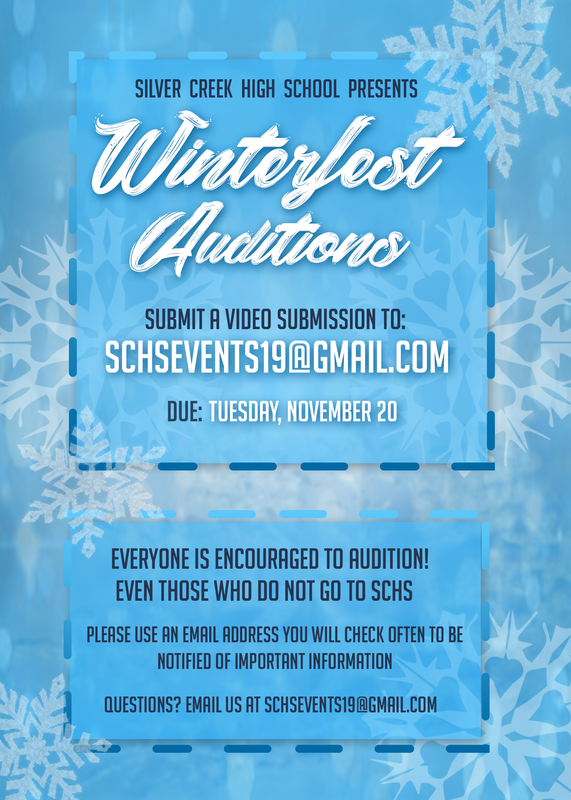 ARE YOU INTERESTED IN AUDITIONING FOR WINTERFEST? Are you interested in showing your talents at Winterfest this year? Winterfest is an annual winter talent show which will take place on December 7, 2018 in Raider Hall. We highly encourage anyone interested in performing and showcasing their talents to audition! Prepare and record at least 1 minute of your performance and submit your video audition to schsevents19@gmail.com by November 20, 2018. Please use an email you will frequently check in order to be notified of any important information regarding the event once you submit! **Note: People who do not go to Silver Creek are also eligible and encouraged to audition as well.